Also called a cross-trainer, an elliptical trainer is a stationary exercise equipment that is helpful for simulating walking, running, or stair climbing without putting too much pressure on the joints. In terms of purpose, a treadmill is similar to an elliptical. However, exercising on a treadmill has more impact on the joints. An elliptical affects the muscles of the upper and lower part of the body at the same time. A treadmill targets mostly the lower part of the body, including the leg, core muscles, quadriceps, gluteus, and calf muscles. Studies show that the elliptical and treadmill are comparable when it comes to calories burned. However, some consider an elliptical to be more efficient at burning calories and fat because it requires less effort on the part of the exerciser. Because an elliptical is low-impact, it has less effect on facial muscles. However, repetitive, high-impact exercise like running on a treadmill can cause collagen to break down. This is something women who are concerned about the signs of aging should be mindful of. Exercising on an elliptical poses almost no impact on the joints because the feet stay in contact with the pads. On the other hand, running is a high impact activity, which is why exercising on a treadmill can stress the joints over time. Consequently, there is a higher risk of injury with a treadmill. In general, the elliptical is safer because it is less stressful on the joints. An elliptical offers a wider variety of movements and intensity. A treadmill only allows you to change the speed and the incline. Using an elliptical, especially for the first time, can be awkward since it requires coordination. A treadmill is easy to use for anyone as long as you know how to walk or run. Because an elliptical is low-impact compared to a treadmill, it is more suitable for overweight individuals, older adults, and people suffering from joint injury or chronic illnesses that require gentle exercise. 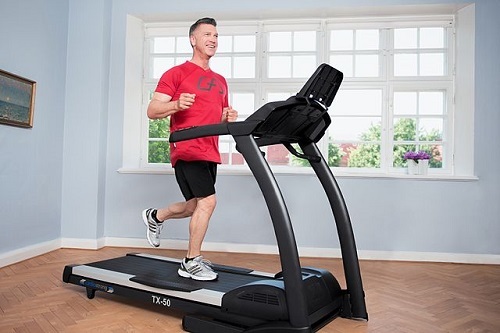 A treadmill is suitable for almost everyone else, particularly runners or joggers. An elliptical typically does not require regular maintenance. Certain treadmills require maintenance every now and then, although you can get a no-maintenance model. Both a treadmill and an elliptical offer benefits to people who want to improve their overall cardiovascular health. However, deciding on whether to get a treadmill or an elliptical depends on several factors. If you want a machine that is low-impact, more efficient at working the muscle groups in your upper and lower body, and ideal for people who are overweight or are suffering from joint injuries, go for an elliptical. If you want a machine that is easy to use and can force you to work outside of your comfort zone, a treadmill is the better choice. Of course, you can enjoy the benefits of both machines by incorporating an elliptical and a treadmill in your exercise regimen. Wendi Garcia. "Difference between Treadmill and Elliptical." DifferenceBetween.net. April 12, 2018 < http://www.differencebetween.net/science/health/difference-between-treadmill-and-elliptical/ >. “Elliptical vs. Treadmill _ Elliptical Machine for Weight Loss.” Super Skinny Me. Sep. 2012. Web. 25 Nov 2017. Deeth, Kevin. “Elliptical vs. Treadmill_ Which is Better.” Built Lean. 11 Apr. 12. Web. 25 Nov 2017. “Elliptical vs Treadmill _ Elliptical Machine Benefits.” Life Span Fitness. 6 Jun 2016. Web. 25 Nov 2017. Duron, Alexandra. “18 Legit Reasons the Elliptical Is Better Than a Treadmill.” Greatist. 25 Feb 2015. Web. 25 Nov 2017.